To do a Dictionary attack, we need to grab a dictionary file. 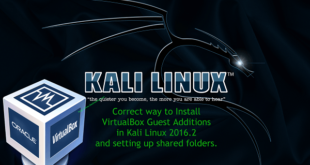 Kali Linux provides some dictionary files as part of its standard installation. How sweet. Thanks Kali Linux Dev team. Let’s copy one of best dictionary file to root directory. Because WPA2 minimum password requirement is 8 characters, let’s parse this file to filter out any passwords that is less than 8 characters and more than 63 characters. (well, you could just leave this line, but it is completely up to you). So we are saving this file as newrockyou.txt name. That’s a whopping 9606665 passwords. Original file contained even more..
That’s 14344392 passwords. So we made this file shorter which means we can test more AP’s in less time. Finally, lets rename this file to wpa.lst. Now we need to create ESSID in Pyrit Database. Awesome, now we have our ESSID added to Pyrit Database. Now that we have our ESSID added to Pyrit database, lets go an import our Password Dictionary. 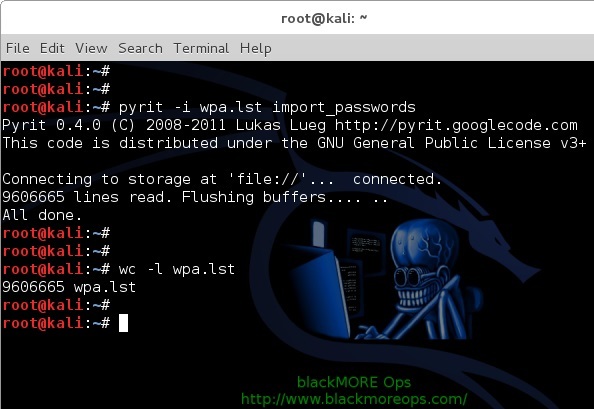 Use the following command to import previously created password dictionary wpa.lst to Pyrit Database. We now need to batch process to create tables. Because I’m on a laptop with a crappy AMD 7500 graphics card, I’m getting only 15019 PMKs per second (that includes my CAL++). If you got a more powerful Graphics card and managed to install either CUDA for NVIDIA Graphics card or CAL++ for AMD Cards, your speed will be a lot more. Oh, and I just took this awesome screenshot while Pyrit was doing the batch processing. Check out my CPU usage, it’s hitting absolutely 100%. You should be careful how big your dictionary file is and how HOT your CPU and Graphics card is burning. Use extra cooling if you can to avoid damage. This is a newbie question, but here goes: if I have two different handshakes from two different ESSID that I want to crack, do I have to run the batch process twice? Sorry after further research, Yes you would need to use the batch process twice. This is because the ESSID acts as a salt to the hashes. Hi, how about cleanup the passwords in Pyrit? I have a .cap file,can you crack it? How would you go about helping ? I am working on this for class and its DRIVING ME INSANE! 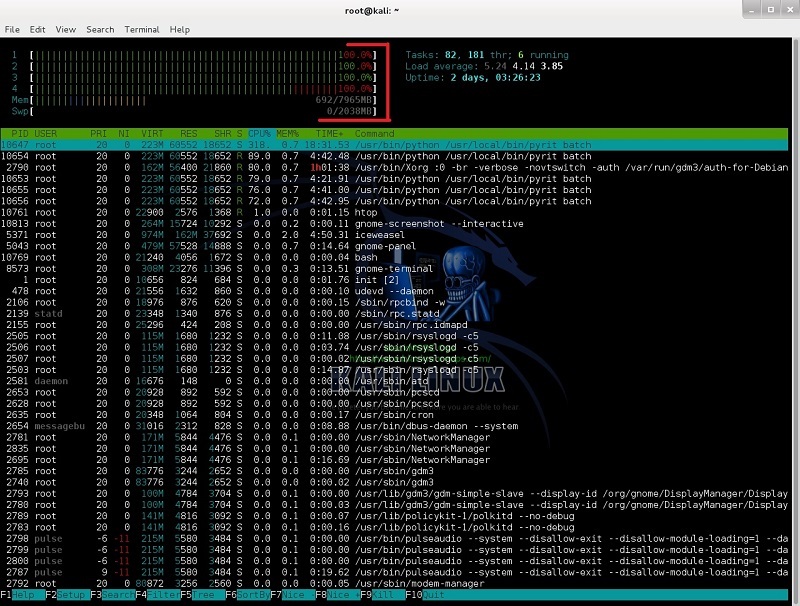 I have used aircrack /bully/reaver as well as crunch but having issues with speeding up the process with hashcat , could you giving me a hand with a file? I hope you can…thanks in advance also. Am I doing something wrong? I don’t understand why you wouldn’t just recommend the attack_cowpatty method if you really can do it w/o creating a batch process to create tables. because of course someone would rather do that at 31 million keys per second than the 15 thousand keys per second you got creating tables. It is very slow compared to your result. Can you tell me what is wrong with it, please. Thank you buddy. I’m having the same exact issue. I have a Sony Vaio F Series : VPCF226FM it has Nvida GeForce with CUDA. Followed all installation steps but it does not seem to be offloading processing to the graphics card. Do you know of any troubleshooting steps I could follow to figure out why and resolve the issue. I did not understand that NVIDIA AMD part. The CPU on a good graphics card can compute the encessary hashes faster than the CPU of motherboard can. so with the proprietary NVIDA or AMD drivers loaded, processing can be offloaded to the Graphics card. i have 2 diffrent handshake, can I just add the essid of the other hand shake into the databse and tun the batch once? Ihave 112gb of wordlist to import and right now im on the 24th hour of importing if I batch this twice maybe I have to wait for a weej to crack that AP. Its a 8-10 digit password.0-9 diffrwnt combination can you crack this hand shake in your DB? Thank you for this tremendous documentation. Just to let you know there is a typo on the command concerning Import Dictionary in Pyrit. Im running a laptop running intel graphics chip. What would be my best route for wifi cracking? Reaver, honestly. Pixie Dust attacks work great as well with Reaver. I’m commenting to come back to this since I’m generally curious to the answer as well. Just wondering My box seems to hang when its flushing the buffers is this usual? I set it to import the passwords before i went to bed but woke up to find my laptop had rebooted running x64 kali on x64 Vbox via win7 x64. Tried to get aircrack going on a wheezy install on another lappy to see if there was a difference but cant get the backport version working and the wiki is out of date. I am wondering why my GPU only works 3% based on status from nvidia-smi either working in pyrit batch process or attack_passthrough directly without batching process. I have been monitoring nvidia-smi every 1 seconds and getting the same value of 3%. I am using NVIDIA GT335 with driver 304.125. I have tried to install the current one for this series (340.76) but didn’t work. Dear… thank you for all your time and effort .. and for helping us , if i win one day a lottery you will get some money from me , you are inspiring me..
Can you create a database only 1 time for a wordlist and use it over again for different passwords? Can you use Cowpatty-> pyrit without creating databases? Thanks blackmore. I followed this very easily nice and clear. no results yet. but im smashing 30k P M K’s after followin your other guide on cpyrit. unfortunately i can’t get cal…++ working so had to settle for O C L. using 1.1/ 3.18 i tried about 5 fresh installs using AMD 2.7 -2.8 -2.9. …i get them all installed properly but i get an operation error every time. Any ideas? i cant really do apt -get upgrade because im tethering from my cell phone,which is why I’m kinda here in the first place lol. Is it possible to create the Pyrit database with the ESSID and wordlist when you aren’t within range of the AP or do you have to be within range the whole time? No. Capturing the handshake is the only part where you need to be within the range of the AP. Thereafter, everything else can be done offline. Thank you. I did some research and found the answer to my question a long time ago, but thanks anyways. Have you done this process before? If so, how many PMK’s/s could your computer calculate during the database batch process? Any feedback is appreciated. This article mentions you don’t need to commence the batch process with Cowpatty. Does this mean you don’t have to pre compute any sort of database at all and can attack the pcap file directly after you capture it? Ok. In comand ~ wifite -wpa ~ didn’t get any handshake but when I type ~ wifite – wpa -aircrack ~ I get a handshake. I’m on Kali by the way. boys please it is possible to run pyrit in way that it will compute PMKs on the fly? 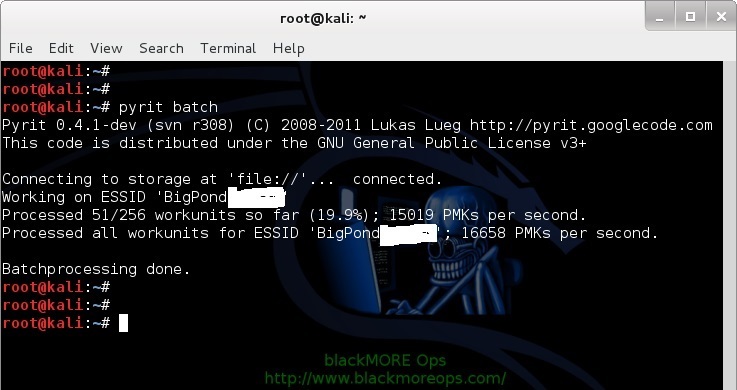 I mean i have created pyrit database and ssid on external drive and since database is too big and i want try mulitple ssids i want to skip batch processing and compute PMKs realtime with hacking attempt. Precomputing PMKs with big database for multiple SSIDs is time consuming either. well i can’t find the .cap file !! I added a 10,000,000 word dictionary to Pyrit. I added 1 essid (Wi-Fi name) to Pyrit. I ran BATCH and it compiled in about 2 hours. Later I might wish to add another dictionary of 100 words. Will I have to execute BATCH again? Will it take another 2 hours…. or will it just quickly process the new 100 words? Later I might wish to add a 2nd essid (Wi-Fi name). Will I have to execute BATCH yet again? Will it take another 2 hours… or will it just quickly process the 1 new essid? Mmm Grandma! Dude my grandma didn’t even have WiFi, she would have told me if I asked, why don’t you just ask her? Did your Gramdma not give you guns to go outback shooting? I think that’s what’s wrong with the word I was at this nursing home with by grandma before she died and I noticed old peoples don’t like when they kids are on the phone typing all day (your mom and dad) which probably pisses her off to see you sit around with your thumbs on a phone all day, watch TV with her go to the American legal and chill with her while she drinks her rum n coke and keep your phone in your pocket.